I just adapted my Christmas Card concept to two new Valentine's Day Cards. 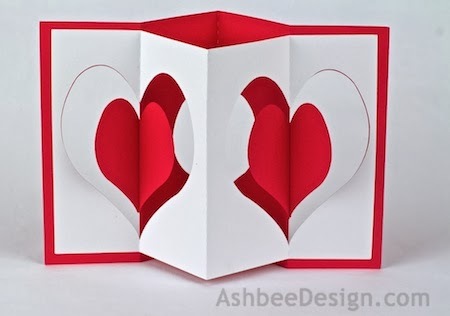 Do you send handmade Valentine's? 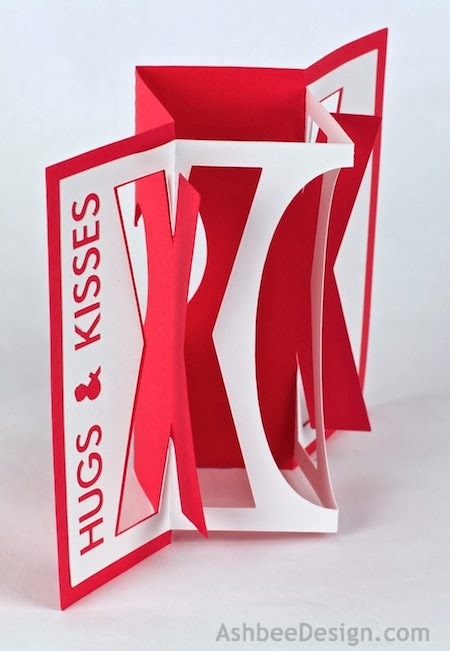 I generally don't but this year I have a stack that evolved as I created my Silhouette tutorial. I will send a few, not 70 like I do for Christmas! This particular design can be hand cut if you don't have a cutting machine and I have included a few directions at the end to assist you. Here is a photo from a different angle to give you a better idea of the construction. the back is a sheet of red and the front is a sheet of white but because of the cuts and folds, the red pops through. 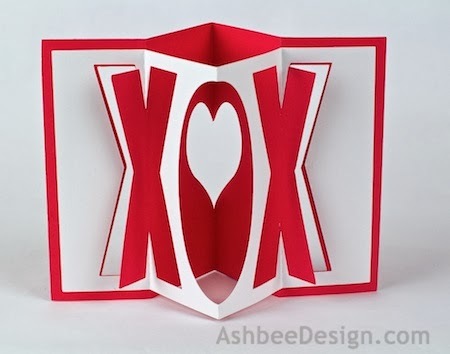 I also created the XOX card without the added words. If you are cutting by hand, this would be the easiest pattern. Download the free Silhouette software here. Purchase the cutting files from the online store. The Heart Accordion Valentine is here. The XOX design is here. Open them in your Silhouette Software. File Menu to Download Pending Orders. Click on the library icon and the downloaded file should be there. Select all and UNGROUP - Object Menu to Ungroup. Remove the text - click on both text items and delete. 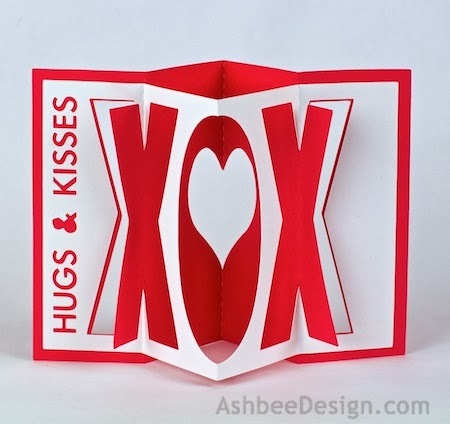 Also remove Hugs & Kisses from XOX design. That would be impossible to cut by hand. Change all cut lines to print lines. Silhouette cut lines have no thickness. To change them, select all and click on the line icon. (Black lines in upper right). Increase the line thickness from 0 to .50. Print the design. This gives you a pattern to follow and cut using a sharp xacto blade. 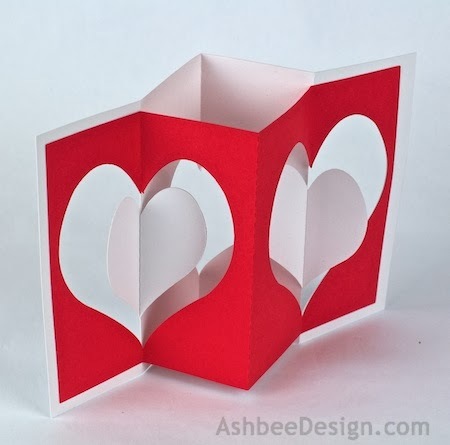 Place this pattern over your card stock and cut through both layers at once. The dotted lines are fold lines. Use a scoring tool and a folding tray to help create the fold lines. 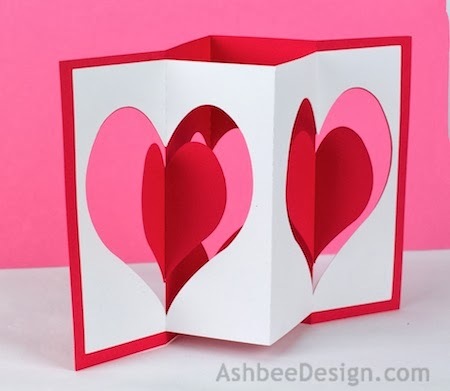 Follow my tutorial here for how to assemble the card. So fantastic….I like them all although I don't send Valentines cards. The hugs and kisses is my favourite. These are so cool! I got a Silhouette for Christmas and I can't believe I still haven't put it to work. This is getting me more motivated to unbox it and get going! I would love if you linked up to The Makers Link Party over on my blog. Have a great day!